This is a side-project I'm working on where I try to make a set of ships based on the same design but with different purposes. So far the set has 7 ships, as follows: fighter, interceptor, bomber, heavy assault fighter, mining ship, gas harvester, repair/salvaging ship, all with a poly count between 18 to 26k. At the moment I'm yet to think of a name for these ships so if you've got some ideas I'd really like if you'd share your thoughts via a comment here. Also, I want to add more ships to the pack, to have somewhere between 8 to 10, so if you have some suggestions as to what other variations would be cool to make, please let me know. Hey SolCommand, looks like the only ship type missing is a scout/stealth ship. On the ship names, I would just make up a corporation and just add some value to it like: Merkon HAF-001 (Merkon Heavy Assualt Fighter). How about a construction ship for RTS games? 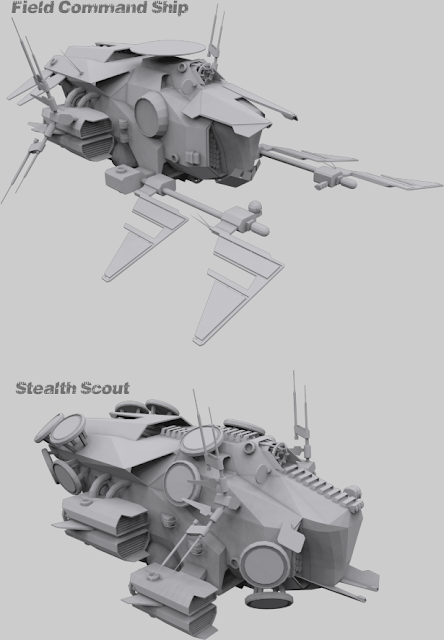 DarkOne, I just tried making a stealth scout version but it looks a bit weird, doesn't fit with the rest of the models so I wont be adding that version to the ship pack, but thanks for the idea as it helped me start a whole new model. JF, cheers for that suggestion. Based on it, I finished making a field command ship that looks great. I also draw some inspiration for it from eve online minmatar ships. I updated the picture, you can find it right at the bottom. John, I believe the current "repair" ship fits as a construction ship just perfectly, as it is fitted with 6 robotic arms with various tools thus it can do pretty much anything in the range of: build, scuttle, repair, salvage, etc. "JF, cheers for that suggestion. Based on it, I finished making a field command ship that looks great. I also draw some inspiration for it from eve online minmatar ships. I updated the picture, you can find it right at the bottom." Darkone, looks like I finally managed to put together a stealth scout too hehe. Its based a little on the design of Matrix ships. The idea is very good. Within constructive criticism i must say that the types of ships also reflect their size which makes using the same sized body frame difficult to use in a realistic way. GAS HARVESTER = GSM-2 'Streammer' or more affectionate known as the "Cosmic Fart Pump" (just kidding). REPAIR & CONSTRUCTION = RC-8 'BlockHammer' Repair Support Vessel. FIELD COMMAND SHIP = TFC-1 'Legion' Tactical Field Command and Control. STEALTH SCOUT = SR-9 'SkyMyst' Stealth Tactical Recon Ship. Yes, you're correct, it's rather difficult to use the same hull for different purposes but I figured if we can do it with cars, why not with spaceships hehe. I mean, you have your BMW "X" car based on which you have a sedan model, a convertible, a coupe, touring etc. so even if they look rather similar, they're different in design details and purpose. That's what I tried doing here, somewhat. About the names, wow, they're so cool that I'm gonna use them all ! 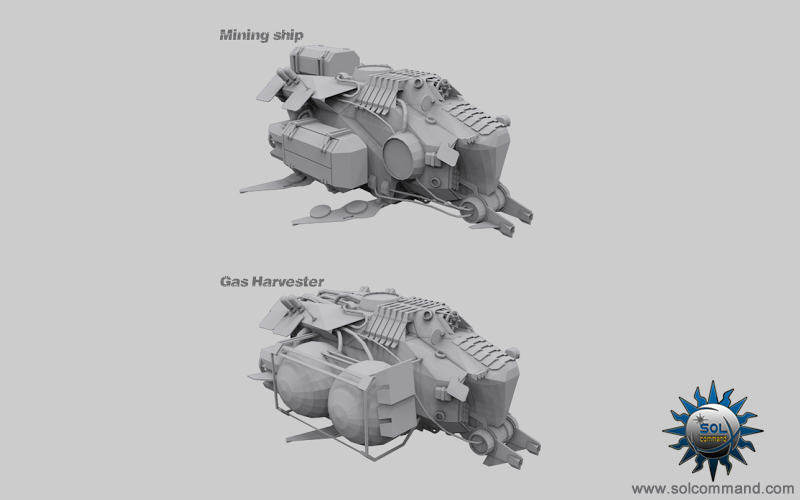 Made slight changes to the mining ship to make it look a bit more industrial and I also added a new model, the cargo transport ship. I will post images shortly. Name changed for the transport ship.